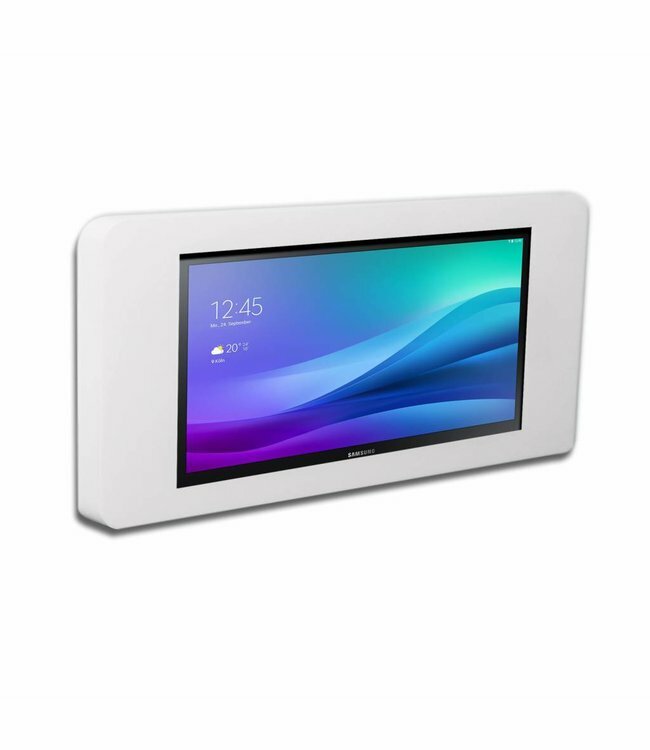 Tablet flat wall mount specially developed for Samsung Galaxy 18.4" tablet. Matte acrylic casing, lockable with a special kit of anti theft security screws. Piatto, flat wall mounted tablet holder for Samsung Galaxy View 18.4"
The flat tablet wall mount “Piatto” is provided with a VESA 100 pattern. The internal construction of the housing takes care of a tight, correctly fitting tablet. The unique “slip and slide” principle provides a sturdy, perfectly fitting tablet housing for your tablet on the wall. The tablet cassette will be locked with an almost invisible recessed safety bolt. The charge cable can be guided through a hole in the holder. A small feature for guidance of the cable, is the choice between directly through the wall or using a channel at the back of the housing either up/down or sideways. Suitable for: Samsung Galaxy View 18.4"